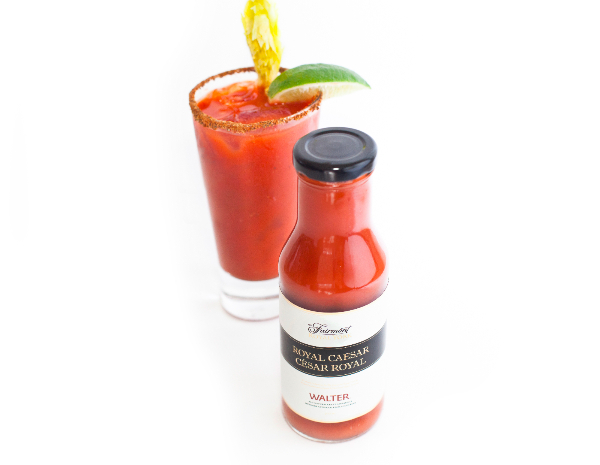 Walter Caesar, the premium all-natural Caesar mix, is thrilled to be the Caesar provider of choice for luxury hotel The Fairmont Royal York. The unique partnership allows guests to enjoy a never-before-tasted version of Canada’s favourite cocktail during their stay in Toronto’s historic gem. The Caesar experts behind Walter Caesar have crafted a very unique Caesar recipe specifically for The Fairmont Royal York’s guests and visitors. Aptly named the Royal Caesar, it will be the only Caesar mix served in the hotel guestrooms, onsite bars and restaurants – a big achievement for the small Canadian start-up. The Walter team is excited and honoured to be the exclusive Caesar mix provider for the iconic hotel. “We’re very proud of our partnership with The Fairmont Royal York and the Royal Caesar, and can’t wait for the guests to try it,” adds Walter co-founder Aaron Harowitz. The all-natural Ocean Wise recommended product will be produced and packaged in individual-sized 300 mL bottles right here in Toronto. Bottles will also be available for purchase at The Fairmont Royal York gift shop.